Barrett’s oesophagus and oesophageal adenocarcinoma: how does acid interfere with cell proliferation and differentiation? Acid, a principal component of gastro-oesophageal refluxate, may contribute to the development and malignant progression of Barrett’s oesophagus. Oesophageal pH monitoring studies have demonstrated that patients with Barrett’s oesophagus have severe and chronic acid reflux. However, there is overlap between the amount of acid exposure in patients with oesophagitis compared with patients with Barrett’s oesophagus. This suggests that factors other than acid may be important in the aberrant oesophageal cell differentiation process that leads to the development of the metaplastic Barrett’s mucosa. The other factors important in the aetiology of Barrett’s oesophagus are poorly understood but probably include both genetic and environmental factors. Barrett’s oesophagus is a disorder characterised by abnormal differentiation and proliferation. The development of the metaplastic Barrett’s mucosa occurs when there is a switch from one differentiated epithelium to another cell lineage not normally found in the oesophagus. Specifically, the normal stratified squamous mucosa is replaced by glandular mucosa, which is usually a mosaic of gastric and intestinal phenotypes. Many investigators restrict the definition of Barrett’s oesophagus to mucosa containing the intestinal subtype, termed intestinal metaplasia. This is characterised by a columnar epithelium with a brush border and goblet cells, accompanied by the expression of intestine specific genes.1 Although the metaplastic Barrett’s mucosa resembles the native gastric or intestinal subtypes it is abnormally differentiated (fig 1). Abnormal differentiation status of the Barrett’s epithelium. 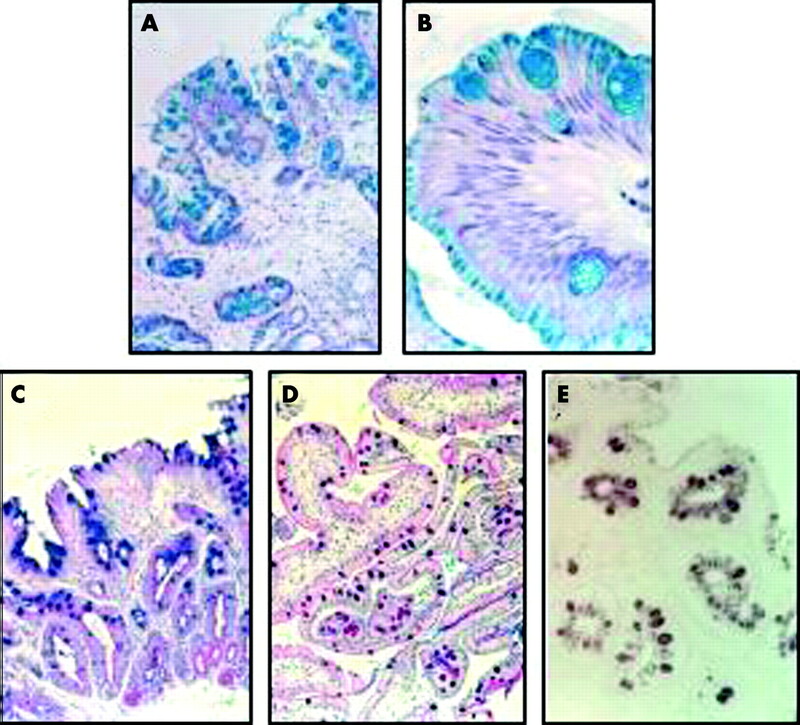 (A) and (B) low and high power fields, respectively, of alcian blue staining in Barrett’s oesophageal sections showing the blue acidic and neutral mucins in goblet and non-goblet columnar cells. (C) PAS–alcian blue staining for neutral mucins (magenta) and N-acetylated sialo-mucins (blue) found in type IIB intestinal metaplasia. (D) the same PAS–alcian blue staining in duodenal section, note that mucins here are mainly neutral (magenta). (E) a high iron diamine–alcian blue staining showing dark brown sulphomucins characteristic of type IIB incomplete IM. The Barrett’s epithelium has abnormal proliferation indices compared with non-metaplastic epithelium found elsewhere in the gastrointestinal tract. For example, the number of proliferating cells in Barrett’s oesophagus is increased compared with squamous oesophagus and duodenum2,3 and there is associated disregulation of cell cycling.4 Furthermore, the proliferative compartment extends beyond the glands and the lower crypts towards the surface5,6 (fig 2). When Barrett’s oesophagus progresses towards cancer, the epithelial cells increasingly subvert the intrinsic mechanisms that limit the proliferative capacity of normal cells. Furthermore, as proliferation increases, the degree of cellular differentiation decreases. This highly proliferative epithelium with altered differentiation is characterised morphologically by dysplasia and may ultimately evolve to invasive cancer (fig 1). Abnormal proliferation compartments of Barrett’s oesophagus and associated dysplasia. Expression of a proliferation marker mini-chromosome maintenance protein (Mcm2) is shown by immunohistochemistry. Whereas the proliferative compartment is confined to the basal layers (normal squamous oesophagus, (A)) and in the crypts and the glands (normal stomach and duodenum, (B) and (C)), in Barrett’s metaplasia proliferation extends towards the surface (D). With increasing dysplasia the number of proliferating cells increases with expansion of the proliferative compartment (E-G). 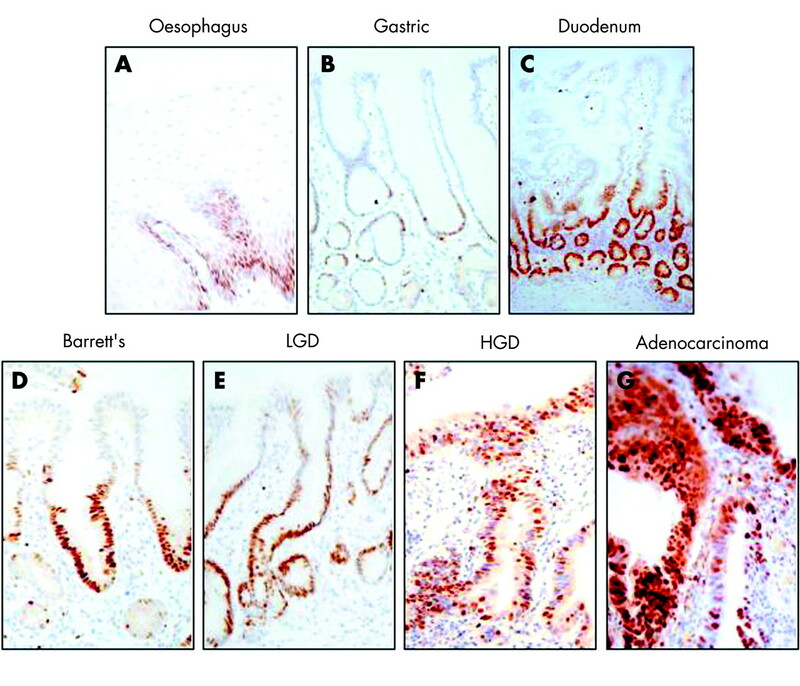 The transition from squamous epithelium to Barrett’s oesophagus and the subsequent dysplasia–carcinoma sequence occurs in the context of exposure to gastroduodenal refluxate. However, the degree to which the components of refluxate have a causal role in the pathogenesis of these phenotypic changes is not fully understood. In this review the discussion will be restricted to acid, a key component of refluxate. However, it should be remembered that the other constituents of refluxate, such as bile, may also play an important role. This review focuses on the role of acid in the differentiation and proliferation of the Barrett’s epithelium with reference to laboratory and clinical studies. The relevance of these observations to clinical practice are then discussed and the areas of uncertainty that warrant further research are highlighted. The phenomenon of metaplasia may occur anywhere throughout the gastrointestinal tract and is thought to be a reparative response to injury. There is increasing evidence that pluripotential stem cells may be capable of differentiation along a lineage quite distinct from the parent organ.13 In the context of Barrett’s oesophagus, it is likely that the pluripotential stem cells in the squamous oesophagus or neighbouring gastric epithelium are triggered to differentiate according to an intestinal type of cell lineage. These intestinal cells will then be able to undergo clonal expansion and hence the abnormal mucosa will be maintained. Three possibilities for the tissue of origin for Barrett’s metaplasia have been hypothesised.1 Firstly, the de novo metaplasia theory proposes that pluripotential stem cells of inflamed squamous mucosa in the exposed papillae are damaged and abnormally differentiate producing Barrett’s stem cells. However, recent human studies suggest, based on β1 integrin expression, that the squamous oesophageal stem cells are located in the interpapillary zone.14 Secondly, the transitional zone metaplasia theory suggests that pluripotential stem cells at the gastro-oesophageal junction (transitional zone) colonise the gastric cardia or distal oesophagus in response to noxious luminal agents. Thirdly, the duct cell metaplasia theory suggests that stem cells located in the glandular neck region of oesophageal ducts are thought to selectively colonise the oesophagus in response to squamous mucosal damage. The basis for this mechanism is the ulcer associated cell lineage.1 All of the proposed theories for the origin of metaplasia require a noxious luminal agent, such as acid. Apart from observational data there is little direct evidence to show that exposure to refluxate has a causal role in the development of Barrett’s metaplasia in humans. The development of Barrett’s metaplasia is rarely observed in vivo and hence it is thought that the columnar lined mucosa probably develops to its full length over a period of weeks.15 Furthermore, to date it has not been possible to induce oesophageal metaplasia in vitro through exposure of cell or organ cultures to acid or other components of refluxate. Hopefully, with more robust animal models combined with a molecular epidemiological approach, the contribution of genetic and environmental factors in the development of Barrett’s metaplasia can be clarified. The striking increase in the incidence of oesophageal adenocarcinoma over the past two to three decades suggests that environmental factors are important. People have suffered from heartburn and indigestion symptoms for many years. Hence, if acid exposure is a risk factor for oesophageal adenocarcinoma,26 it is not clear why there should have been such a dramatic increase in incidence in recent years. Several reasons have been proposed to explain the recent increasing incidence of reflux disease. Firstly, the population in the West have been getting fatter, which will tend to lead to the development of a hiatus hernia and to a disruption of the anatomy of the gastro-oesophageal junction. Secondly, there has been an increase in the use of drugs that reduce the lower oesophageal sphincter pressure. Thirdly, eradication of H pylori will tend to restore the acid secreting capacity of the stomach and lead to an increase in the acid content of refluxate. Fourthly, it has been suggested that the increased ingestion of nitrate containing foods in the white middle classes and the widespread use of nitrate based fertilisers since the second world war may have resulted in increased nitrate concentrations in the stomach, which may in turn increase the likelihood of reflux occurring.30,31 However, these plausible explanations remain hypotheses that require substantiating by epidemiological studies. Although it has been clearly demonstrated that there is a hyperproliferative response following pulsatile acid and bile exposure, it has not been proven that this contributes to the development of dysplasia. 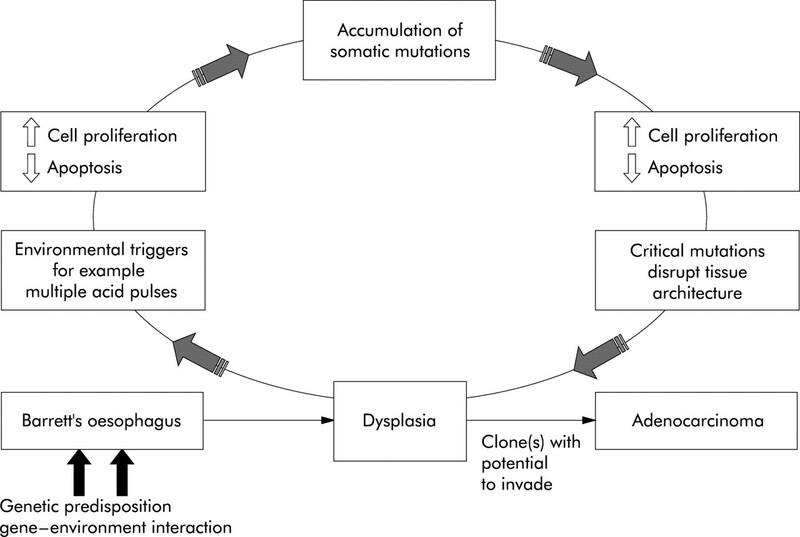 It is possible that the hyperproliferative response of Barrett’s epithelial cells may lead to an accumulation of genetic abnormalities through a vicious cycle effect (fig 3). This may explain the degree of variation in somatic mutations seen between individuals. For example, a study of evolutionary relationships of somatic mutations suggests that mutations occur in no obligate order and clonal expansion of genetic instability leads to cancer over a process of months to years.42 Alternatively, key somatic mutations may be the primary event leading to altered cellular proliferation independent of acid exposure, which could be an epiphenomenon. These issues need further investigation. Acid and other luminal constituents may lead to a hyperproliferative and anti-apoptotic response of Barrett’s epithelial cells. This in turn may lead to an accumulation of genetic abnormalities through a vicious cycle effect. The somatic mutations may be accumulated in a non-predictable order. Cancer will occur once the mutation(s) provides the cells with the capacity to invade. In the light of the laboratory findings that pulsatile acid exposure increases Barrett’s epithelial cell proliferation and that increased COX-2 expression is associated with carcinogenesis, there has been an interest in using acid suppressants and COX-2 inhibitors as cancer chemoprevention agents. A preliminary clinical study has shown that after 6 months’ of complete acid suppression on a proton pump inhibitor (PPI), villin expression increased and proliferating cell nuclear antigen (PCNA) expression decreased (p<0.001), (n = 24 patients). In contrast, after 6 months’ of persistent acid reflux on a PPI there was no change in villin or PCNA expression (n = 15 patients).43 These findings suggest that complete acid suppression may be important in order to increase cell differentiation and reduce cell proliferation. However, the sample size and the follow up period was not sufficient to determine whether the incidence of dysplasia would be different between the two groups. Antireflux surgery is an alternative to pharmacological acid suppression, which should also control the reflux of bile and other potentially important constituents of refluxate. Several investigators have analysed the incidence of oesophageal adenocarcinoma in patients with Barrett’s oesophagus who have been treated with either acid suppressants or surgical antireflux procedures. The outcomes of these studies are conflicting (less incident adenocarcinomas in the surgical group,45,46 (less incidence carcinomas in the PPI group47,48). The largest of these studies was the cohort study by Ye et al48 in which data were available from over 6000 patients in the surgical group. Interestingly, although the incidence of oesophageal adenocarcinoma was 14-fold higher following antireflux surgery, there was also a 6-fold increase in patients on medical treatment for reflux compared with the control group. There are several problems with these studies. Firstly, we do not know whether the patients had complete or incomplete acid suppression on medical treatment or following anti-reflux surgery. Secondly, over the time period that these studies were conducted both the acid suppressant drugs evolved as well as the types of antireflux surgery. There have been some concerns raised about the potential detrimental effects of complete acid suppression, such as the effects of bacterial overgrowth and long term hypergastrinaemia, which may in itself increase the risk of cancer development. A recent paper has added credence to this hypothesis by demonstrating that the Barrett’s epithelium expressed cholecystikinin receptors and gastrin can induce proliferation via these receptors in vitro.54 However, to date the clinical risks appear to be hypothetical and there is no evidence to contradict the widely held view that long term PPI treatment appears to be extremely safe. However, in my view, until it is shown that complete acid suppression has a role in cancer prevention then complete acid suppression cannot be advocated. Furthermore, without the evidence base for this practice complete acid suppression may pose unnecessary side effects on the patients with a significant cost attached. It has been recognised for some time that a large, long term randomised controlled trial is required in order to test the role for acid suppressants and COX-2 inhibitors as chemopreventive agents. In summary, Barrett’s oesophagus is an epithelium characterised by abnormal differentiation and proliferation. The significance of acid on the development and progression of Barrett’s oesophagus is still not fully understood. It is increasingly apparent that acid exposure has to be seen in the context of other environmental and molecular factors. I am grateful to Christine Fox for her help with the manuscript and to Pierre Sirieix and Salem Abdalla for their help with the figures. Jankowski JA, Harrison RF, Perry I, et al. Barrett’s metaplasia. Lancet2000;356:2079–85. Gillen P , Keeling P, Byrne PJ, et al. Implication of duodenogastric reflux in the pathogenesis of Barrett’s esophagus. Br J Surg1988;75:540–3. Fitzgerald RC, Omary MB, Triadafilopoulos G. Dynamic effects of acid on Barrett’s esophagus: an ex vivo differentiation and proliferation model. J Clin Invest1996;98:2120–8. Reid BJ, Sanchez CA, Blount PL, et al. Barrett’s esophagus: cell cycle abnormalities in advancing stages of neoplastic progression. Gastroenterology1993;105:119–29. Going JJ, Keith WN, Neilson L, et al. Aberrant expression of minichromosome maintenance proteins 2 and 5, and Ki-67 in dysplastic squamous oesophageal epithelium and Barrett’s mucosa. Gut2002;50:373–7. Sirieix P , O’Donovan M, Brown J, et al. Surface expression of mini-chromosome maintenance proteins provides a novel method for detecting patients at risk for developing adeocarcinoma in Barrett’s oesophagus. Clin Cancer Res2003;9:2560–6. Vaezi M , Richter J. Role of acid and duodenogastroesophageal reflux in gastro-oesophageal reflux disease. Gastroenterology1996;111:1192. Stein HJ, Kauer WK, Feussner H, et al. Bile reflux in benign and malignant Barrett’s esophagus: effect of medical acid suppression and nissen fundoplication. J Gastrointest Surg1998;2:333–41. Stein HJ, Hoeft S, DeMeester TR. Functional foregut abnormalities in Barrett’s esophagus. J Thorac Cardiovasc Surg1993;105:107–11. Fitzgerald R , Lascar R, Triadafilopoulos G. Barrett’s oesophagus, dysplasia and pharmacologica acid suppression. Aliment Pharmacol Ther2001;15:269–76. Harmon JW, Johnson LF, Maydonovitch CL. Effects of acid and bile salts on the rabbit esophageal mucosa. Dig Dis Sci1981;26:65–72. Nehra D , Howell P, Williams CP, et al. Toxic bile acids in gastro-oesophageal reflux disease: influence of gastric acidity. Gut1999;44:598–602. Tosh D , Slack JM. How cells change their phenotype. Nat Rev Mol Cell Biol2002;3:187–94. Seery JP. Stem cells of the oesophageal epithelium. J Cell Sci2002;115:1783–9. Cameron AJ, Lomboy CT. Barrett’s esophagus: age, prevalence and extent of columnar epithelium. Gastroenterology1992;103:1241–5. Sampliner R , Camargo L, Fass R. Impact of esophageal acid exposure on the endoscopic reversal of Barrett’s esophagus. Am J Gastroenterol2002;97:270–4. Kahaleh M , Laethem J-LV, Nagy N, et al. Long term follow-up and predictive factors in barrett’s esophagus treated by argon plasma coagulation and omeprazole. Gastroenterology2001;120:A2105. Goldstein S , Yang G, Curtis S, et al. Development of esophageal metaplasia and adenocarcinoma in a rat surgical model without the use of a carcinogen. Carcinogenesis1997;18:2265–70. Li H , Walsh TN, O’Dowd G, et al. Mechanisms of columnar metaplasia and squamous regeneration in experimental Barrett’s esophagus. Surgery1992;115:176–81. Buttar NS, Wang KK, Leontovich O, et al. Chemoprevention of esophageal adenocarcinoma by COX-2 inhibitors in an animal model of Barrett’s esophagus. Gastroenterology2002;122:1101–12. Silberg DG, Sullivan J, Kang E, et al. Cdx2 ectopic expression induces gastric intestinal metaplasia in transgenic mice. Gastroenterology2002;122:689–96. Fitzgerald RC, Onwuegbusi BA, Bajaj-Elliott M, et al. Diversity in the oesophageal phenotypic response to gastro-oesophageal reflux: immunological determinants. Gut2002;50:451–9. Fitzgerald R , Abdalla S, Onwuegbusi B, et al. Inflammatory gradient in Barrett’s oesophagus: implications for disease complications. Gut2002;51:316–322. Mann NS, Tsai MF, Nair PK. Barrett’s esophagus in patients with symptomatic reflux esophagitis. Am J Gastroenterol1989;84:1494–6. Winters C , Spurling T, Chobanian S, et al. Barrett’s esophagus: a prevalent occult complication of gastro-oesophageal reflux disease. Gastroenterology1987;92:118–24. Lagergren J , Bergstrom R, Lindgren A, et al. Symptomatic gastroesophageal reflux as a risk factor for oesophageal adenocarcinoma. New Engl J Med1999;340:825–32. el-Serag HB, Sonnenberg A. Opposing time trends of peptic ulcer and reflux disease. Gut1998;43:327–33. Prach AT, MacDonald TA, Hopwood DA, et al. Increasing incidence of Barrett’s oesophagus: education, enthusiasm, or epidemiology? Lancet1997;350:933. Caygill CP, Reed PI, Johnston BJ, et al. A single centre’s 20 years’ experience of columnar-lined (Barrett’s) oesophagus diagnosis. Eur J Gastroenterol Hepatol1999;11:1355–8. Fletcher J , Wirz A, Young J, et al. Unbuffered highly acidic gastric juice exists at the gastroesophageal junction after a meal. Gastroenterology2001;121:775–83. Spechler SJ. Carcinogenesis at the gastroesophageal junction: free radicals at the frontier. Gastroenterology2002;122:1518–20. Souza RF, Shewmake K, Terada LS, et al. Acid exposure activates the mitogen-activated protein kinase pathways in Barrett’s esophagus. Gastroenterology2002;122:299–307. Kaur B , Omary M, Triadafilopoulos G. Bile salt-induced cell proliferation in an ex vivo model of Barrett’s esophagus is associated with specific PKC isoform modulation. American Journal of Gastrointestinal & Liver Physiology2000;278:G1000–9. Putney LK, Barber DL. Na-H exchange-dependent increase in intracellular pH times G2/M entry and transition. J Biol Chem2003;278:44645–9. Fitzgerald R , Omary M, Triadafilopoulos G. Altered sodium-hydrogen exchange activity is a mechanism for acid-induced hyperproliferation in Barrett’s esophagus. American Journal of Physiology1998;275:G47–G55. Morgan C , Alazawi W, Sirieix P, et al. Immediate and early gene response to in vitro acid exposure in a Barrett’s adenocarcinoma cell line [abstract]. Am J Gastroenterol2004;99:218–24. Wilson KT, Fu S, Ramanujam KS, et al. Increased expression of inducible nitric oxide synthase and cyclooxygenase-2 in Barrett’s esophagus and associated adenocarcinomas. Cancer Res1998;58:2929–34. Shirvani V , Ouatu-Luscar R, Kaur B, et al. Cyclo-oxygenase 2 expression in Barrett’s esophagus and adenocarcinoma. ex vivo induction by bile salts and acid exposure. Gastroenterology2000;118:487–96. Kaur BS, Triadafilopoulos G. Acid- and bile-induced PGE(2) release and hyperproliferation in Barrett’s esophagus are COX-2 and PKC-epsilon dependent. American Journal of Gastrointestinal & Liver Physiology2002;283:G327–34. Buttar NS, Wang KK, Leontovick O. Chemopreventive potential of selective cyclo-oxygenase 2 inhibition in Barrett’s epithelium: an in vitro study. Gastroenterology2002;122:1101–12. Souza RF, Shewmake K, Beer DG, et al. Selective inhibition of cyclooxygenase-2 suppresses growth and induces apoptosis in human esophageal adenocarcinoma cells. Cancer Res2000;60:5767–72. Barrett MT, Sanchez CA, Prevo LJ, et al. Evolution of neoplastic cell lineages in Barrett oesophagus. Nat Genet1999;22:106–9. Ouatu-Luscar R , Fitzgerald R, Triadafilopoulos G. Differentiation and proliferation in Barrett’s esophagus and the effects of acid suppression. Gatsroenterology1999;117:327–35. Umansky M , Yasui W, Hallak A, et al. Proton pump inhibitors reduce cell cycle abnormalities in Barrett’s esophagus. Oncogene2001;20:7987–91. McDonald ML, Trastek VF, Allen MS, et al. Barretts’s esophagus: does an antireflux procedure reduce the need for endoscopic surveillance? J Thorac Cardiovasc Surg. 1996;111: 1135–8 (discussion 1139–40),. Katz D , Rothstein R, Schned A, et al. The development of dysplasia and adenocarcinoma during endoscopic surveillance of Barrett’s esophagus. Am J Gastroenterol1998;93:536–41. Williamson WA, Ellis FH Jr, Gibb SP, et al. Effect of antireflux operation on Barrett’s mucosa. Ann Thorac Surg. 1990;49: 537–41 (discussion 541–2),. Ye W , Chow WH, Lagergren J, et al. Risk of adenocarcinomas of the esophagus and gastric cardia in patients with gastroesophageal reflux diseases and after antireflux surgery. Gastroenterology2001;121:1286–93. Katzka D , Castell D. Successful elimination of reflux symptoms does not ensure adequate control of acid reflux in Barrett’s oesophagus. Gastroenterology1994;89:989–91. Ouatu-Luscar R , Triadafilopoulos G. Complete elimination of reflux symptoms does not guarantee normalisation of intraesophageal acid reflux in patients with Barrett’s esophagus. Am J Gastroenterol1998;93:711–6. Shrinivasan R , Ramakrishnan A, Katzka D, et al. Effect of maximal acid reflux control on Barrett’s esophagus. Am J Gatsroenterol1999;94:A93. Castell DO. Succesful elimination of reflux symptoms does not insure adequate control of acid reflux in patients with Barrett’s esophagus. Am J Gastro1994;89:989–91. Katz PO, Frissora C. The pharmacology and clinical relevance of proton pump inhibitors. Curr Gastroenterol Rep2002;4:459–62. Haigh CR, Attwood SE, Thompson DG, et al. Gastrin induces proliferation in Barrett’s metaplasia through activation of the CCK2 receptor. Gastroenterology2003;124:615–25. Farrow DC, Vaughan TL, Hansten PD, et al. Use of aspirin and other nonsteroidal anti-inflammatory drugs and risk of esophageal and gastric cancer. Cancer Epidemiol Biomarkers Prev1998;7:97–102. Bosetti C , Talamini R, Franceschi S, et al. Aspirin use and cancers of the upper aerodigestive tract. Br J Cancer2003;88:672–4. Kaur BS, Khamnehei N, Iravani M, et al. Rofecoxib inhibits cyclooxygenase 2 expression and activity and reduces cell proliferation in Barrett’s esophagus. Gastroenterology2002;123:60–7. Rebecca Fitzgerald is funded by the Medical Research Council. Conflicts of interest: The author has given occasional talks for the manufacturers of PPIs and COX-2 inhibitors.